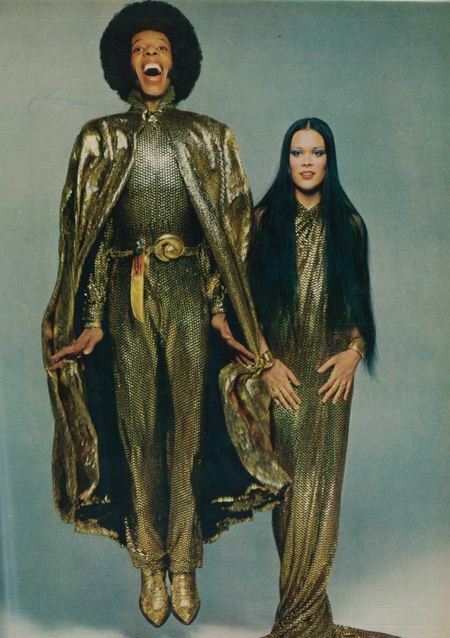 Can You Believe Sly Stone and His Wife Got Married in the Most Amazing Gold Outfits?! I love the seventies! It was such a glamorous and free time especially for black people in the entertainment industry. We were truly flourishing in that decade in the most positive ways. But one thing that is for true is anything went when it came to fashion. Like Sly Stone and his then wife, Kathy Silva (pictured above) when they got married in matching gold Halston outfits. He wore what looks to be a jumpsuit and a cape and she looked increasing beautiful in a long gold dress.They married in 1971 during one of Sly’s concerts at Madison Square Garden in New York. Despite their union only lasting a few years, their wedding outfits are engraved in vintage fashion history as 1970’s luxury at it’s finest. I’m not the Smithsonian, but I am the proud owner of the remnants of the gold lame material used in the weeding outfits of Sly Stone & Kathy Silva. They were given to me by Sly’s sister Vet, some years ago. My goodness! You’re very lucky to have such a beautiful piece of music AND fashion history.